Costs – Before you call a tree service professional in Olympia, Washington, see what other tree owners have paid for services in the area with our average costs for tree maintenance and removal. FAQs – Many trees in Olympia have thrived because they’re native and common. However, it’s important to know what goes into their care and which trees not to plant. Learn more. Services – Call an Olympia tree service professional today to get your trees taken care of. How Much Do Tree Services Cost in Olympia? Located just south of the Puget Sound, Olympia is a lush and green destination as well as the state capital of Washington. The Marine West Coast climate sets the scene for plenty of trees and vibrant greenery, but maintenance for property owners can still be a major concern. Use this guide for estimates on the cost of tree trimming, tree removal and stump removal in Olympia, Washington. As you might expect, the cost of removing an entire tree is more expensive than simply getting rid of the stump. However, bringing in professionals to tackle the job can make it much simpler, faster and safer than tackling the project on your own. In Olympia, the cost of removing an entire tree averages out to $670, but the cost may rise for extremely tall trees or trees that have branches over a major structure or overhead power line. Removing a tree stump on your property can be a big undertaking, and the equipment needed to grind a large stump may not be available for rent. Thankfully, professionals can bring their commercial-size stump grinder on-site and remove even large stumps in just minutes. Expect to pay up to $149 to have a single tree stump removed in Olympia, Washington. Even if there are no trees or stumps on your property that need to be removed, professionals in the tree business can still help improve the look of your real estate. Trimming branches costs about $568, and tree maintenance crews prune trees to allow them to grow properly and bear fruit or flowers. Just south of Washington’s Puget Sound is Olympia. This beautiful capital city has a humid environment with lots of cloud cover and frequent rainy days, which combines with the relatively stable temperature to create a lush environment full of trees. Since temperatures rarely dip below freezing or get hot even in the summer, many different plants thrive. Whether you are starting a garden, landscaping your property or just learning more about the area, these tree tips for Olympia can be a big help. The City of Olympia has very specific requirements regarding homeowners and tree removal. The government makes a strong effort to keep the city green, which means that property owners must have at least one tree unit for every 1,500 square feet of property. Particularly large trees may count as more than one unit, but this chart can help. If you have fewer trees that the minimum guideline, then every tree you remove will require a permit. Otherwise, you are free to landscape your property as you wish. PSE, or Puget Sound Energy, is the primary electricity provider to the Olympia area. Since they run and maintain the city’s overhead power lines, they provide recommendations to property owners for which trees to plant and what to trim. If you see branches on a power line, you can call for assistance, and the PSE maintenance teams will remove the threat at no cost to the homeowner. If you are planting new trees, follow their recommendations, and avoid putting large trees within 25 feet of overhead lines. It is generally believed in the forestry field that trees simply can’t grow much taller than 350 feet in height, but the region surrounding Olympia has been home to a number of felled trees close to or even over that guideline. Today, the world’s largest spruce tree is 191 feet tall and is found just outside of Olympia near the town of Quinalt. For a truly unique tree, find Olympia’s famed Moon Tree, which was planted by seeds taken to space by astronaut Stuart Roosa. To find out whether a particular tree will be able to thrive in this region’s climate, you will want to take a look at its hardiness zone rating, which is determined by the United States Department of Agriculture, or USDA. 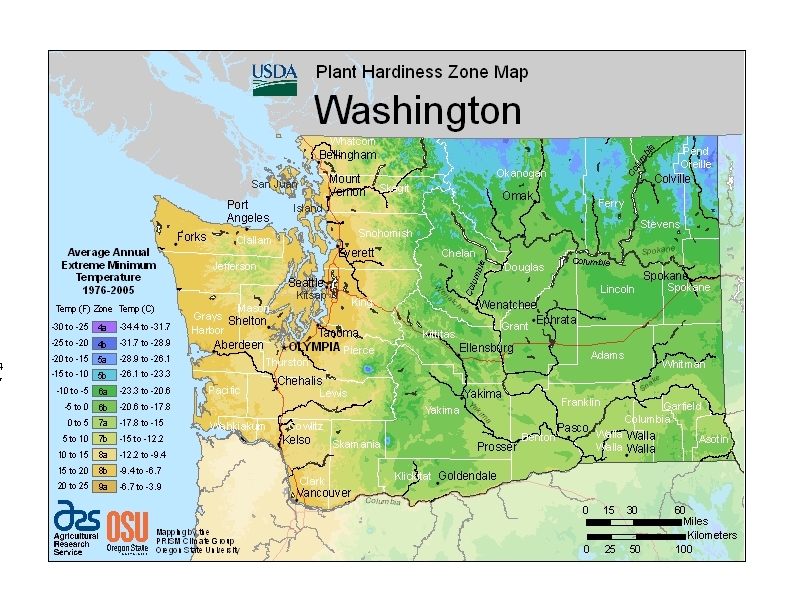 Olympia is in the USDA Zone 7b, so the trees that will thrive will be as close to that number as possible. Avoid trees with a rating lower than 4b, as they will require cooler temperatures, as well as those above 9a, which require more sunshine and warmer temperatures. 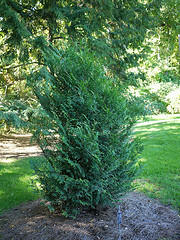 The official state tree of Washington is the Tsuga heterophylla, better known to many as the western hemlock. This large evergreen tree is coniferous, and it is also native to the Pacific Northwest as well as much of the West Coast. 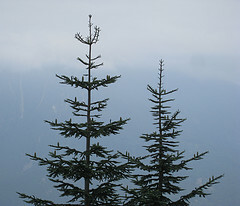 Olympia is home to hundreds of western hemlocks, many of which grow in the wild without maintenance. Thanks to the moderate climate, many different fruits that can’t tolerate frost or high temperatures are able to thrive in Olympia. Just a handful of the many varieties that gardeners can grow on their properties include apricots, peaches, nectarines, apples, cherries, pears and plums. While many trees grow successfully in the Olympia area without problem, others deal with common pests, diseases and other concerns. Some of the typical tree ailments that can occur, according to the University of Washington Botanic Gardens, include black pineleaf scale, cherry bark tortrix, cypress moths, needle drop and downy mildew.